Keep up to date with news, announcements and updates from your Home Office Team. Join Michelle Fee, Vicky Garcia, Brian Shultz to learn about all the latest and greatest announcements from CP. A review of the exciting strides that Cruise Planners has made so far in 2018. Join Theresa Scalzitti, VP Sales & Marketing, to get an update on several marketing tools including CP Insights, Travel Styles, Trigger Email Updates, CP Video Network and much more. 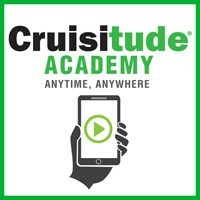 A new series is coming to Cruisitude Academy! be the first one to hear from our founder and CEO Michelle Fee about this exciting series designed to help you sharpen your sales skills.